Both President Trump and Prime Minister Imran Khan share the desire for achieving peace in Afghanistan,” this was stated by Ambassador Dr. Asad M. Khan, Pakistan’s Ambassador to the U.S. while addressing a dinner hosted in his honor by the South Asian community in Maryland. In his remarks, Ambassador Khan said that Pakistan attached highest importance to its ties with the U.S. After a difficult period, today both countries have a common interest in securing peace and stability in Afghanistan. Both President Trump and Prime Minister Imran Khan are on the same page today in their desire to achieve peace in Afghanistan, said Amb. Khan. The U.S. is one of our largest trading partners and a key export destination. We definitely want to enhance these ties. He further said that Pakistan was pursuing a policy of peaceful neighborhood. It wanted good relations with all neighbors including India. The decision to open the Kartarpura Corridor was taken in this spirit. It was unfortunate that India used the Pulwama attack to create war frenzy and increase tensions in the region. Pakistan has offered to investigate any evidence that will be shared and to engage in dialogue with India. Representatives of the Sikh American community, who were also present on the occasion, welcomed Ambassador Dr. Asad M. Khan and thanked the Government of Pakistan for opening the Kartarpura corridor. Amb. Dr. Asad M. Khan gave an overview of Prime Minister Imran Khan’s vision to build a New Pakistan, with a focus on human and social development. He mentioned that the Government had taken a number of initiatives in health, education, housing and employment generation. It was working hard to create macroeconomic stability and an investment friendly environment to attract foreign investors. Pakistan was soon opening up its visa policy to attract foreign visitors including religious tourism. 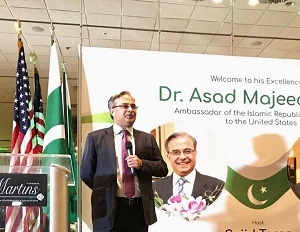 The Ambassador particularly lauded the services of the Pakistani American community in the U.S. and asked them to continue to play an active role in building better relations between the two countries. He said the Embassy would work actively with the community to enhance Pakistan-U.S. ties. Ambassador Khan acknowledged the contribution of Mr. Sajid Tarar, a Pakistani American leader of the Republican Party and asked other members of the Pakistani American community to work hard for building stronger ties between the two countries. The dinner was attended by a large number of South Asian community members, predominantly Pakistani Americans, as well as senior officials of the State of Maryland.